The Path Planning module is used to determine a route from one coordinate location to another along a set of waypoints. For example, if you had an image of a maze and you needed to determine the best path from where the robot is currently located to where it needs to be you would use the Path Planning module to determine the shortest or best path to the desired location. Note that the robot's location is labeled as a circle with an X in it. 1. Robot Location - Specify the start location (X,Y) coordinate of where the robot is currently located. Note that you can type in variables using [variable_name_x] into these dialog entry boxes. This allows you to use the RoboRealm application to determine where the robot is visually located and where the robot needs to go and feed that information into the path planner. 2. Destination - Specify the end location (X,Y) that specify the robots destination. 3. Waypoints - Add in waypoint coordinates that the robot is suggested to go through. Note that if the waypoints are NOT in a traversable path they will be ignored. The waypoints can either be manually entered using the provided interface or configured to read the points from a specified variable. 4. 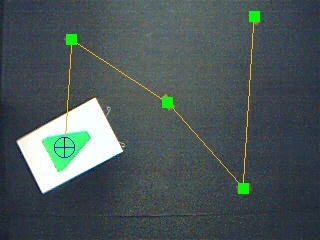 Removal Distance - Specify how close the robot need to be to a waypoint (in pixels) before it is considered traversed and removed from the waypoint target list. 5. Reset - Once all waypoints have been visited you can press the Reset button to reset all waypoints to a non-visited state. 6. Reset Trigger - You can also select a variable when non-empty will also cause the reset to trigger. This is handy if you want programmatic control over clearing all visited waypoints. 7. Path - select "Plot along non-zero pixels" if the current image contains the path boundaries as non-black pixels. This allows you to restrict the robot movement to a selected path or line instead of considering all parts of the image traversable. With this checkbox selected the path planning module operates within the 'white' or on pixels within an image. Any pixel that is non-black is considered part of the potential path. Any pixels that are black are considered non- traversable. 8. Optimal Shortest Path - select this checkbox if you want the system to automatically determine the optimal shortest path to all waypoints. If this is not selected then waypoints are visited in the order they appear in the manual waypoints list or in the waypoint variable. Note that due to the complexity of finding the shortest path only 17 waypoints can be used in this algorithm. 9. Greedy Shortest Path - select to automatically determine a non-optimal but fast shortest path for more than 17 points. This algorithm selects the next nearest waypoint as the direction of travel. While not optimal it does work well for most cases. See the Path Planning tutorial for more information. path in an attempt to get the robot back on track. PLAN_COORDINATES - An array that includes all the path points as displayed by this module. WAYPOINT_NUMBER - the current waypoint number being traversed to. WAYPOINT_X - the X coordinate of the current waypoint number being traversed to. WAYPOINT_Y - the Y coordinate of the current waypoint number being traversed to.